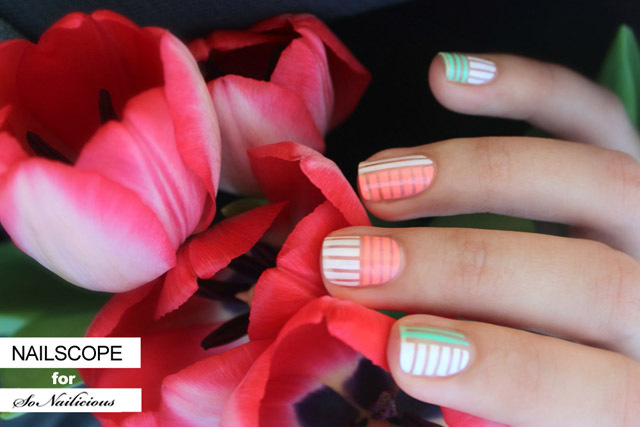 This Bright Pastel manicure incorporates two of the biggest trends of this season, lines and negative space. The two work together so well bringing a fresh and light feel to whole look. Done in white and bright pastels colours this nail art is crisp and modern It’s perfect for any season be it spring or winter (for a more winery feel use blue nail polish instead of coral or green). This nail art is relatively easy to do to. It doesn’t require any drawing skills, but you will need patience and accuracy when dealing with the striping tape. 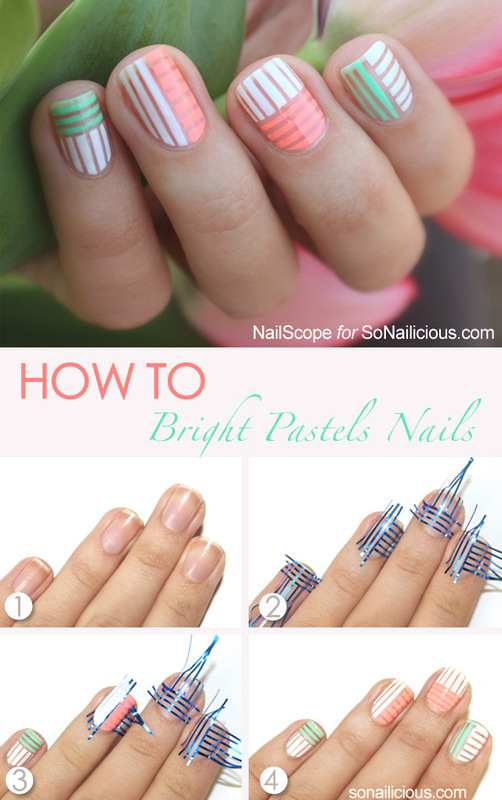 Check out our tutorial below to learn how to do these bright pastel nails at home. Apply a base coat and wait until completely dry. Now, work one nail at a time. Paint the horizontal stripes in one colour (coral) and the vertical lines in the other colour (mint). Then carefully remove the striping tape with tweezers and repeat this step on other nails. When all nails are done, apply 2 coats of a quick dry clear top coat and you’re finished! Used: Orly Nailtrition base, Zoya Purity (white), China Glaze Flip Flop Fantasy (bright coral pastel), Daewon #184 (bright mint), Seche Vite top coat. 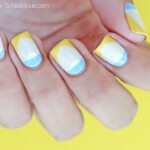 Hope you enjoyed this Bright Pastel nail art tutorial! Look forward to seeing your version! If you recreate this nail design, make sure you tag Elina @nailscope and @So_Nailicious in your photo on Instagram we’d love to see your work!